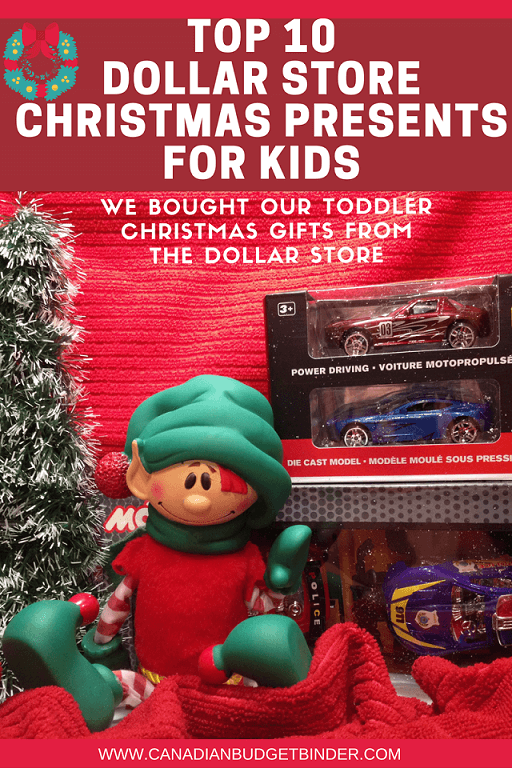 THE TOP TEN DOLLAR STORE CHRISTMAS PRESENTS FOR KIDS ARE SIMPLE BUT FUN. Christmas presents are only part of the holiday season but one of the most expensive. While some parents might drop a jaw reading the title of this post and say they’d never spend money buying Christmas Presents at the Dollar store for their children other parents say this is all they can afford. Our little guy is working his way up to three years old and recognizes toys and anything that goes zoom from a mile away. That’s why we chose to find the Top 10 Hottest Christmas Presents for boys and girls at the Dollar Store this week. Whether you think the toys are cheap that’s up to you but remember what you buy will soon be buried and forgotten. How’s that for a smile and a wad of cash? Kids only get what we give them. Your choice, Your money. We have no issues with stopping by Mastermind Toys, Toys R Us or any other store that offers children’s toys with our boy. He’s perfectly happy just looking at the boxes and on occasion playing with toys that he can get his little hands on. We’re a frugal family (like that’s a secret) and although we are debt free that doesn’t mean that we will rush out to spend money. We’re still on a budget like everyone else who follows this blog. The reason we are debt free is because we didn’t spend frivolously and if we picked up this habit now we could get ourselves into hot water. It’s fairly easy to blow through money these days especially after paying our hydro bills. There’s no shame in being frugal unless you allow society to dictate to you that you’re wrong. It’s not bad parenting practices when you don’t give your children everything they want. Not at all. Related: Does your employer offer you a Christmas bonus or do you rely on a Christmas budget? In our minds there are no good gifts and bad gifts because Christmas isn’t about a Christmas Gift Guide or who’s selling the cool Christmas gifts of the season, it’s about family. It’s also about friends, co-workers and anyone that inspires our world or makes it a better place if even from miles away a simple phone call comes in. Christmas around the world is different for everyone no matter what society says or believes you must do to keep up with consumer demand of the hottest Christmas presents on the market. This holiday season we keep hearing and reading about are parents going wild to buy their children Hatchimals. Most might agree these toys will be a week-long fad and end up at the bottom of the toy box. Some parents will do just about anything and pay outrageous scalper prices to get their hands on what their kids want. For a toy that you can purchase for around $90 if you’re lucky to find one on the shelves you can buy online for upwards of $200-$15,000. It happens every year with a specific toy whether it’s Cabbage Patch Dolls, Tickle Me Elmo or Pokemon. I’m not joking either. You can look on Ebay and you’ll see this ad below for a $15,000 Hatchimal. I should darn well hope they ship it out FAST and Pronto for that unreal price. The manufacturer of the Hatchimal can’t promise there will be any on the shelves before Christmas. They are working hard to produce more. I’m sure they are in shock just how crazy their product has made its way into the toy market. Is this seller taking advantage of desperate parents? $15,000 for a Hatchimal!?? What!?! I get it. It’s insane. But I’m broke and desperate times call for desperate measures. I’m hoping someone with a beautiful bank account sees this listing… wants a Hatchimal for their child… and doesn’t put a price tag on their child’s happiness. This listing is for the Teal Pengula Hatchimal, but if you don’t like the Teal one, I also have a Pink Pengula or a Burtle you could send me a message amount. Also.. I will ship the Hatchimal you buy out PRONTO. Fastest shipping I can find. Promise. The Hatchimals I bought were supposed to be Christmas gifts for my nieces, but I’m sure even if they don’t get these marvelous egg toys… they will still be OK. So, if you are reading this and can afford to help me out.. please PLEASE click ‘Buy it Now’. You would be making my (and my family’s) Christmas VERY merry! Thank you in advance & Merry Christmas back at ya! I’m sure by now if you don’t already know you want to know what in the world a Hatchimal is. I don’t blame you since it’s one of the hottest Christmas presents on the Christmas gift list of many children. Brace yourselves…because all of this hype around the Hatchimal has caused prices to soar especially since it’s a hot ticket item. When your child has their heart set on a specific toy because their friends want it this puts parents in a tough position. They want to make their kids happy on Christmas morning but at what cost are they willing to pay? Hatchimals are magical creatures that live inside of eggs. Who’s inside? It’s a surprise! Each egg contains one of two interactive Hatchimals. Love and care for yours inside the egg and its eyes will light up as it makes cute sounds, telling you how it’s feeling! Once you’ve played with it enough, you’ll see rainbow eyes—that means its time to hatch! Hatchimals can’t hatch on their own. Your touch encourages them to peck their way out of the egg! It’s a once-in-a-lifetime experience! Now you get to raise your furry Hatchimal through 3 stages, from baby to toddler, to kid. Your Hatchimal sings “Hatchy Birthday” each time it enters a new stage! Teach yours to walk, dance, play games and more! It will even repeat what you say in its own voice! Hatchimals — who will you hatch? The thrill of this toy is when the egg hatches to see what Hatchimal they get but after that it becomes just that, another toy to add to the shelf. Our son is still young but even then he gets gifts from relatives that are far too pricey that he will only break and forget fairly quick. We understand the gesture but he simply doesn’t need expensive toys at this age. Mrs. CBB and I don’t want to put such a huge focus on expensive Christmas presents for our son. We want him to understand the reason for the season and why we all come together for a family. The problem is as kids get older and they want what their friends are getting especially if they want to stay with the in-crowd. Social media only adds to the excitement and anxiety some kids get when they fear they won’t get one of the in-toys. It shouldn’t be that way especially when many parents can’t afford the price tags on some of these toys to begin with. Certainly budgeting all year will help ease the pain of the extra expenses come December even if you have to save $2-$5 a month. Every bit helps. These days we don’t buy each other Christmas presents any longer because it’s not about our happy faces it’s about seeing our son smile. He’s perfectly fine with Christmas presents from the Dollar Store. In fact when we let him loose in the Dollar store he loves it and thinks it’s the best thing in the world. He doesn’t know any better but I’m sure as he gets older we will set limits on what we buy for him. Our Christmas budget for the little guy is $25-$50 which includes an article of clothing, stocking stuffers, toys and children’s books or a DVD. Related: How old is too old to buy someone a Christmas gift? Most kids just want gift cards when they are in their teens because they want to buy what they want. No stress there for parents. I believe us adults give in too easily with the marketing of toys for kids but on the other hand we don’t mind buying them for the right price. What do I mean the right price? Mrs. CBB and I love “new to us stuff” which simply means we have no problem buying used or brand new items in a box from a seller. Typically this would come from Kijiji a Facebook auction group or a garage sale. Our son wouldn’t care if he opened his Christmas presents and they were cars we bought from Value Village. He’s at the age that it doesn’t really matter. Second-hand shops have plenty of Christmas presents you can give for a fraction of the cost of new, especially toys and children’s books. We are always thinking about Christmas presents and other holidays throughout the year so we can keep our Christmas budget in check. One of the worst things that can happen is shopping for Christmas presents at the last-minute which can get pricey. Typically us men are guilty of this. The mall is always flooded with men come Christmas Eve. We live in a consumer driven society of wants and must-haves which make the manufacturer richer and us poorer. If you are uncertain what to get someone there is nothing wrong with buying a gift card. You could add a bottle of alcohol, flowers, candle, chocolate, perfume or another appropriate small gift. The best gift of all is always homemade though. You could make pickles, jam or other condiments and beauty them up and give them away as Christmas presents. You won’t find any name brands below because it’s not about the brand, it’s about the gift of giving. Stocking Stuffers for everyone! Chocolates, Candy Canes etc. You can even buy teacher gifts at the Dollar store that any teacher would appreciate such as scented candles, chocolates or have the kids make something homemade with arts and crafts paired with a gift card for Tim Hortons, Starbucks or any other coffee shop. We’ve gotten so caught up in the game of Christmas presents that the broke are becoming even further in debt and those that have money are blowing it. You can spend as much money as you want on your kids but be mindful that the financial aftershock could last months until the bills are paid. Christmas Day is spent at the in-laws house which begins with an amazing breakfast prepared by my sister-in-law followed by jazzed up espresso by my father-in-law. Christmas greetings, hugs and kisses don’t end until everyone has gotten a squeeze and a pinch on the cheek. There’s something special in the air on Christmas morning when everyone waddles from their comfy beds into the living-room. We sit around the Christmas tree with our morning coffee, hair in all different directions and smiles on our (some hungover) faces. It’s a wonderful feeling and even better if snowflakes are falling filling the ground with white marshmallow fluff. As we sit together the kids one by one open their Christmas presents. They always seem to be very happy but less enthused about clothing. (boring) My point is that you don’t have to exclusively shop at the high-end toy stores to buy all of your Christmas presents. You don’t have to spend hundreds or even thousands of dollars on hot Christmas presents of the season because then we are missing the point of Christmas. Shop the Dollar Store for bits and bobs and your kids won’t know the difference. Wait until after the hype is over and then buy your child a toy that is out of stock but back to a reasonable price. While you are out and about this holiday season don’t forget the joy in singing Christmas songs. Show up at a few of your neighbours homes with homemade goodies and entertain them with Christmas carols. That’s all you need to do to put a smile on this Christmas season. Describe how you purchase Christmas presents for your kids, family members, corporate gifts, teachers gifts, co-workers gifts etc. Do you give in to the expensive hype on the hottest Christmas gifts like the Hatchimal? I sewed my nephew a fleece Pikachu hat a few years ago for Christmas and to this day he says it’s the best gift he’s ever gotten. I try to buy all my nieces and nephews a small gift and then make them something unique they couldn’t find easily elsewhere. This year, my youngest nephew gets a crocheted toque with a beard. Making the gifts is usually (not always-the price of alpaca yarn is absolutely insane) inexpensive, but they seem to care for those gifts a great deal longer than the others. I try to avoid buying things with metal at the dollar stores because of concerns over lead and other toxic materials, but the green army men are usually a big hit! Also their hard plastic dinosaurs, farm animals, etc. My husband built a small toy barn with a fold-back roof and filled it with dollar store farm animals and our daughter was OVER THE MOON. When my daughter was young, I didn’t have the finances to splurge on her but she did get one present wrapped under a table (didn’t have a tree, nor wanted one). She was happy with the one gift. These days, we talk about what we should spend for Christmas for her. I don’t make Christmas any different than any other day because it’s not. The consumerism that has gotten into people has taken away from the reason for the season. We stopped buying gifts for everyone a few years back now. It was getting out of hand. Now we just buy for the kids and give everyone a holiday scratch ticket package with a Christmas card. Sure when my kids were little I could buy them whatever I wanted but as they got older I would try to buy them what they wanted for Christmas. Who wants to disappoint their children at Christmas? I always tried to buy the one special gift my kids wanted (within reason). One year it was a Furby that was all the rage, another year the Spice girl dolls. When they were older it was a Wii for a gift shared between them. We definitely had a budget for what we would buy at Christmas and made them aware if they asked for something that was too expensive that they would not get it. We did not go overboard and each child would have their one special gift and a few small ones. That’s just it. We were at Canadian Tire today and the amount of people who were coming out with loads of expensive toys was insane. Even though they were on sale they were still pricey. For the most part you can bet they will be tossed in a bin or closet in no time. I guess it’s all about the thrill even if it’s for a week or a month. Thanks for stopping by Glenn. Hubby and I decided 30 years ago that we don’t purchase “things” for the most part. We give the gift of our time to those we love during the month of December. We plan lunches, dinners, trips to look at the Christmas lights, the CPR holiday train and whatever other holiday events/festivals/bazaars we can attend with friends and family. About 5 years ago we started giving Secret Santa gifts just because it’s fun. This year hubby and I chose to make the theme for these trinkets be “family”. We treated a couple to a Christmas dinner date, sent Christmas puzzles for another family to work on together after dinner, a tea basket with lovely winter cups for a couple to enjoy on their Christmas morning and a basket of some chocolate flavored teas and bars to another household. I save up all year long so that we can send a few little treats off and we get to enjoy the feeling of giving.